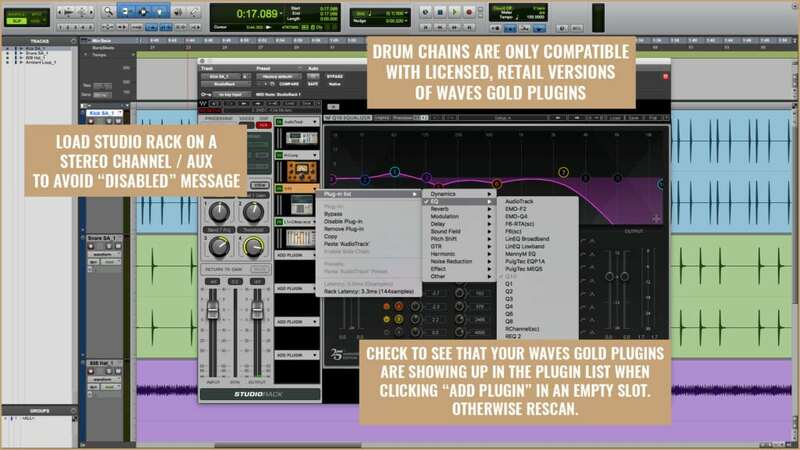 Divine Mixing Drum Chains requires Waves Gold and Waves Studio Rack (Free Utility) V9 and higher with valid licenses. You can install the latest versions from Waves Central. 1. Install the latest versions of Waves Studio Rack and Waves Gold Bundle. Restart your DAW. Drum Chains was designed for use in Waves Studio Rack to provide the most flexible and powerful setup in all DAWs. However, channel strip settings and track presets are also included, which DO NOT require Studio Rack (Logic Pro X and Cubase Pro users only). + Why do I have to use a stereo version of StudioRack on a stereo audio track or aux? The presets in Drum Chains contain effects such as stereo reverbs, stereo delays, stereo doubling and other stereo enhancing effects that must be routed through a stereo output. You can still utilize a mono drum recording routed to a stereo effect plugin or aux without issues.